2018 Season Dates: Monday, November 19th thru Thursday, December 27th. Legacies in Lights: Information is located here..
We are proud to present this website where you can learn more about us, see our displays, and even help to support the Lights of the Delta. 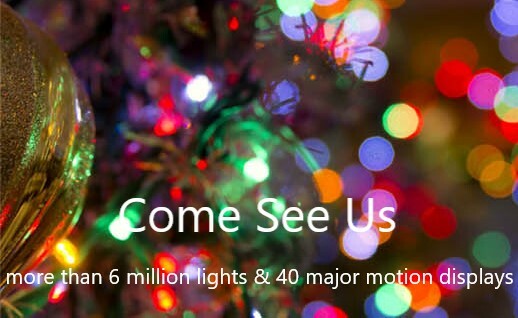 We are the largest lighting display in the Mid-South with 6 million lights and 48 + major motion displays on a 40 acre drive thru site. Below is the link to where you can download your photo taken during your visit to Santa..
Click on the link below to go to the booking site or go to our Facebook page. The 2018 season is fast approaching. We are looking forward to getting the season underway. We have several new displays, have made several improvements, and are working to continually improve the experience for our visitors. Preparing for your visit: As you prepare to visit the lights check out our page that offers suggestions to make your visit more enjoyable. We are continually trying to improve our presence with the social media and trying to convince Santa to get with the Twitter age.